CONWAY, Ark. — With 90 minutes left Saturday in the Mercury College B.A.S.S. National Championship, Stephen F. Austin’s Andrew Upshaw and Ryan Watkins had a five-bass limit weighing about 13 pounds in the boat. They didn’t think that would be enough to win the tournament. Eighty-minutes later, after deciding to move to the deepest area of 1,200-acre Beaver Fork Lake, they had been able to cull three bass and get their weight up to 15-4. That proved to be the difference in the five-team final as Auburn’s Jordan Lee and Shane Powell finished second with 13-10. Beaver Fork Lake marked the third body of water fished in this three-day championship event, which started on the Arkansas River, then moved to Lake Maumelle for Day Two. The emotional roller coaster isn’t over for Upshaw and Watkins. They will fish against each other Sunday for six hours on a private reservoir near Little Rock to determine the first-ever Bassmaster Classic berth from the collegiate ranks. Auburn’s Lee and Powell jumped from eighth place after Day One into the final qualifying spot on Day Two. All five teams started with a clean slate Saturday. Auburn finished less than 2 pounds short of a national title Saturday. Georgia’s Randy Tolbert and Chase Simmemon caught a pair of 4-pound bass, including the biggest fish of the day, a 4-4, but finished with 12-15 for third place. Georgia, with Tolbert on the squad, was second in last year’s championship. In rounding out the finals, Texas A&M’s Andy Schafer and Weston Brown were fourth with 7-7. Virginia Tech’s Wyatt Blevins and Carson Rejzer, who led on the first two days of the tournament, weighed-in 11-5, but were hit with a pound-a-minute penalty for being five minutes late to check-in and finished with 6-5. After their outboard motor wouldn’t start, they had to be towed back to the launch ramp. For more information about the Mercury College B.A.S.S. 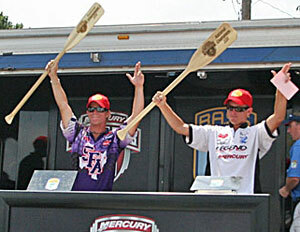 National Championship, go to www.bassmaster.com. Final results are on the College Fishing Forum.